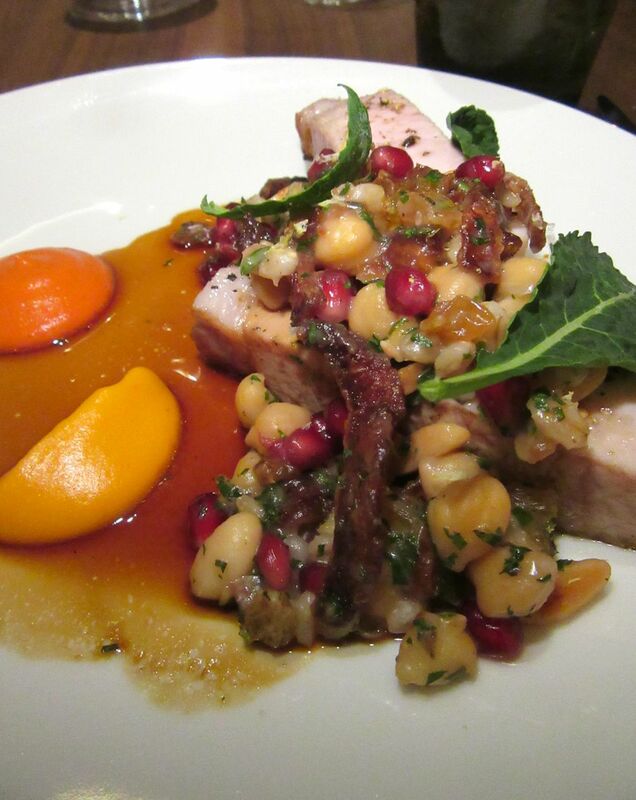 Thick slices of roast pork are blanketed with chickpeas and pomegranate seeds alongside carrot purée. I’m from Detroit. I learned how to drive in a truck with a shift at 14. 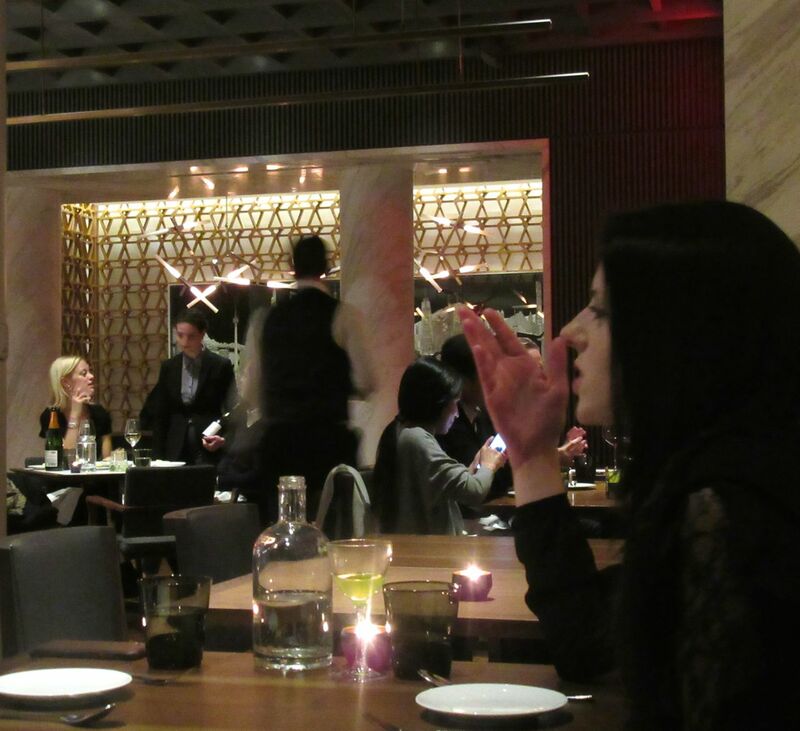 I can’t say exactly what I expected of dinner at Intersect by Lexus. I’ve been a New Yorker now since 1957 and the last time I drove my own car, decades ago, it was a silver BMW my husband won in our divorce and later gave back to me for my summers in the Hamptons. Don Forst was a very special guy. I never knew how special till long after the divorce when I discovered he had been sleeping with the French woman across the hall. I see some familiar faces waiting at the second floor cocktail bar. Photo by Dana Stoddard. A cloud of these memories encloses me as I step into what I expect to be an auto showroom with diners eating foie gras and raw fluke. There is no Lexus in sight. 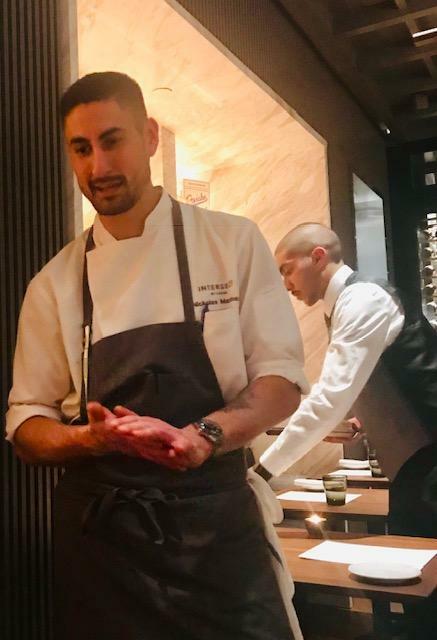 Maybe Danny Meyer, whose Union Square Hospitality Group drafts a new chef to reign here every four to six months, borrowed the showroom model to sneak away. I choose the elevator over the grand glass-and-steel staircase to the second floor. The dining room has an open kitchen and a slatted ceiling. It soon fills up. I’m surprised to see Danny at the bar looking anxious to escape the fervent gossip of my friend and Citymeals colleague Bob Grimes. Bob reluctantly gets up to join my niece Dana and me for dinner. The maître d’ reminds me that we’ve met elsewhere many times over the years as he leads us to a table looking into the kitchen, against the wall of book shelves with its modest collection of odds and ends. “I love seeing you sitting right under Danny’s book, Setting the Table, Bob tells his wife Ellen. Inside the warm gougères is Comte Mornay, too hot to eat at first. Warm gougères oozing Comte Mornay arrive. Each wears a mortarboard of black truffle. 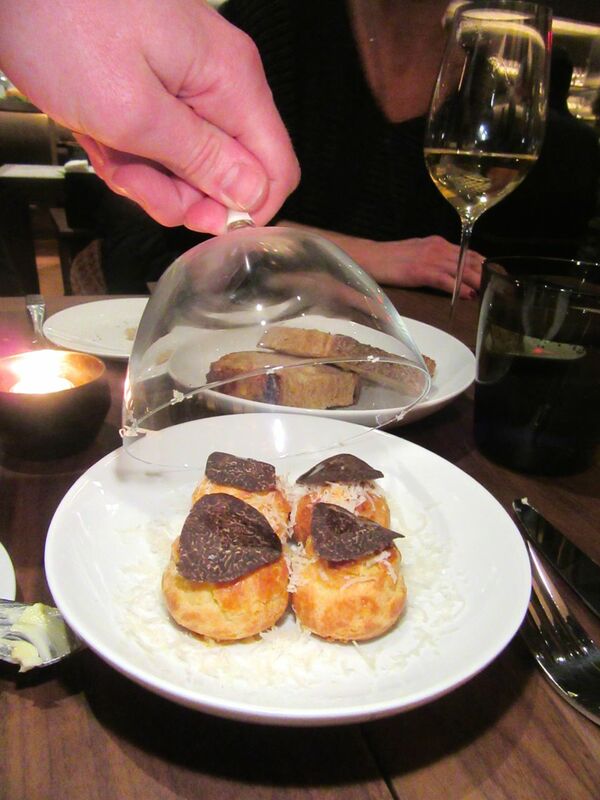 You didn’t get a truffle on your amuse? I’m sorry. 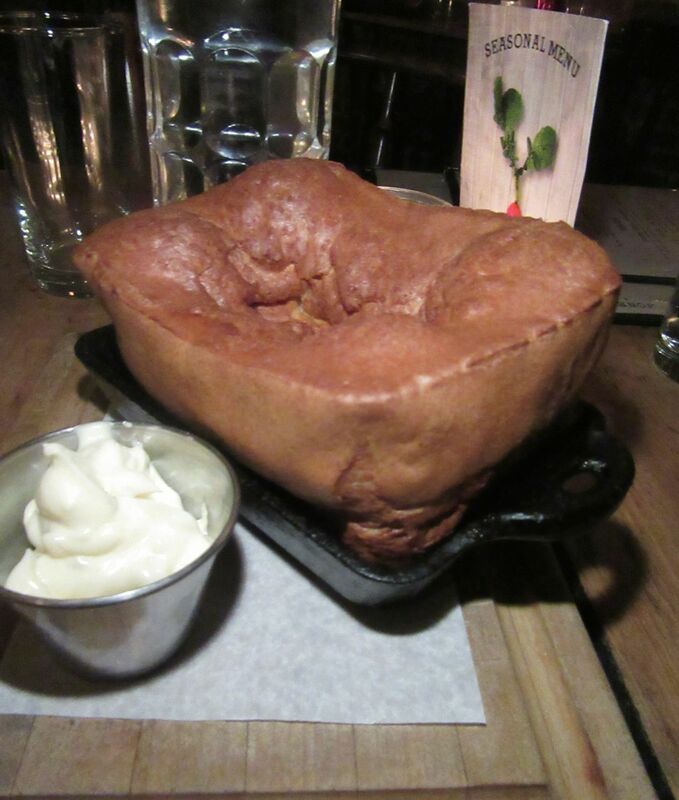 Recognized restaurant critics seem to attract indulgences. 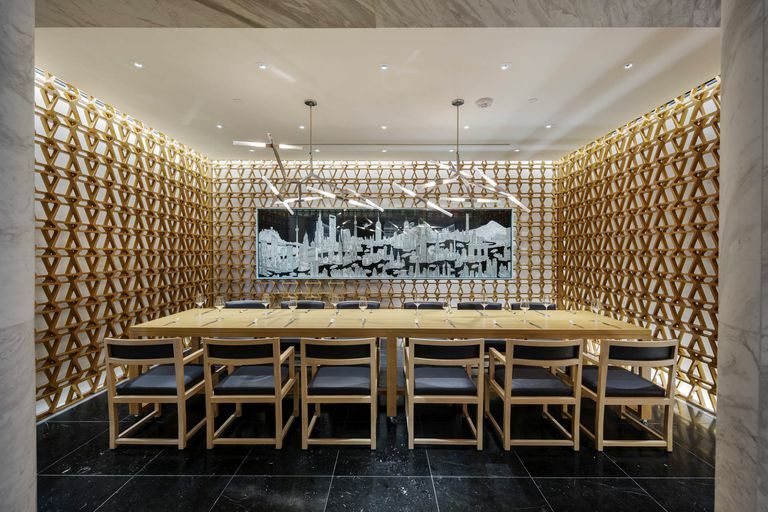 A private dining room at Intersect by Lexus. 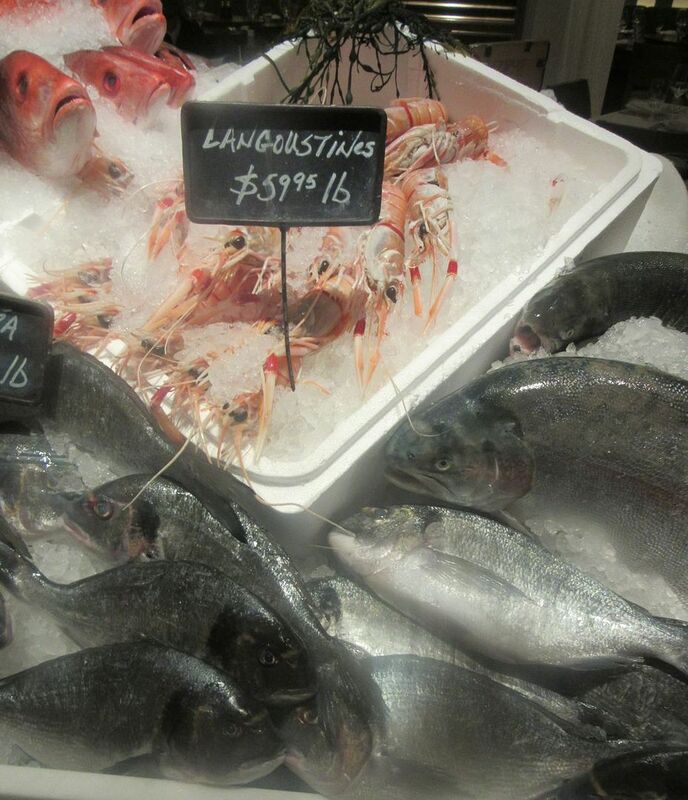 Nickolas Martinez is the executive chef who will direct the kitchen regardless of what star chef does the menu. The room is handsome -- big and bright with fat marble columns, a herringbone floor and bare black walnut tables with bird’s-wing edges. I learned that from my architect companion at my first dinner here. Full-time executive chef Nickolas Martinez comes by to say hello. From my seat against the wall, I watch the kitchen drama. My pals with backs to the room could use a mirror. I’m not a fan of cooked carrots, so I’m pleased to discover carrots tastily backed with ferro and qumquat. 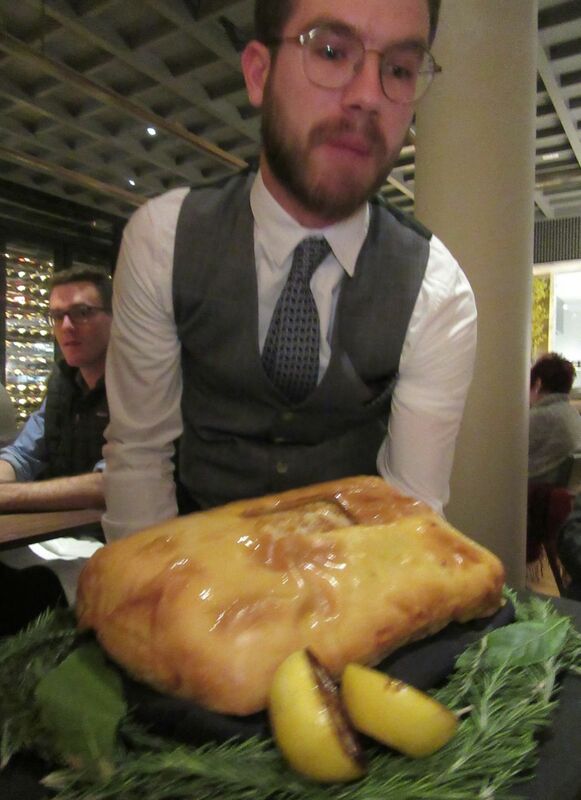 Chef Gregory Marchand of Frenchie in Paris is the Global Chef-in-Residence for the next several weeks. 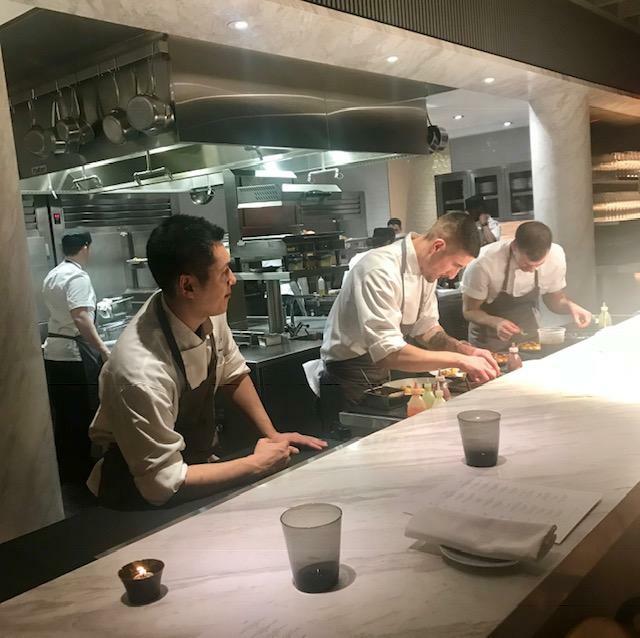 Michelin gave Frenchie its first star a week ago and the jubilant staff posted here on 14th Street went out to celebrate. I’ve never been to Frenchie in Paris so the bowls and plates chosen by Marchand are just plates and bowls to me. 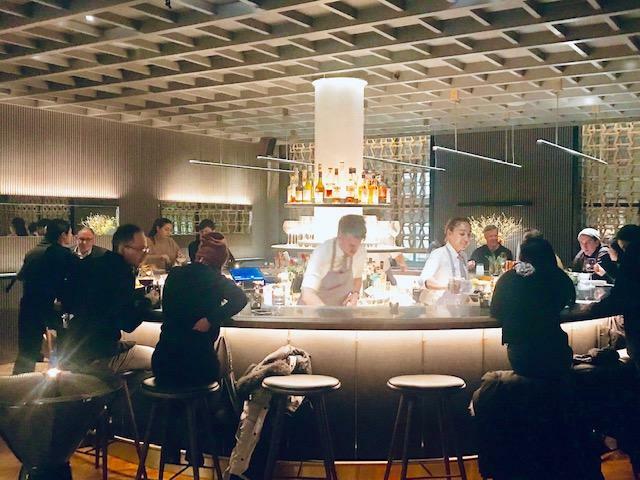 I do find some arrangements overly complicated, with gently swirling patterns that look as if the chef is plating on a turntable, as Pete Wells noted in the Times. 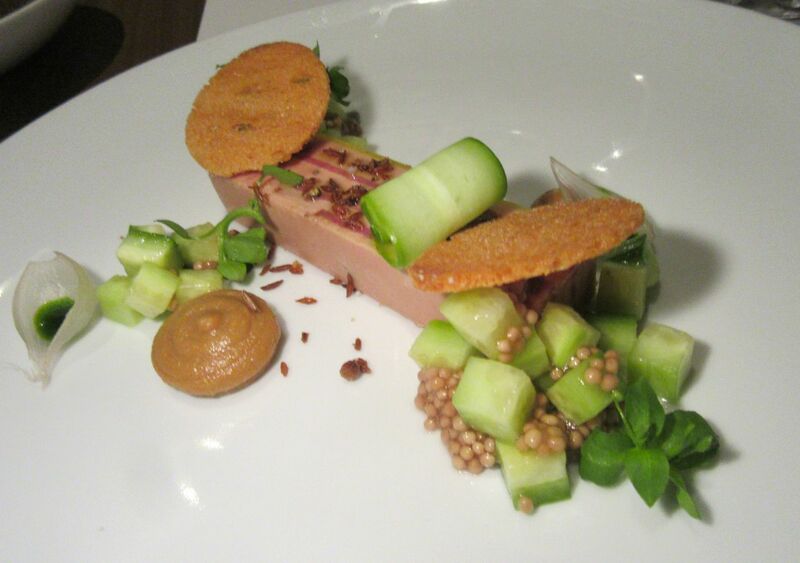 Frenchie chef Gregory Marchand does foie gras with pastrami, cucumber and candied spices. A toss of salad greens sits on translucent slices of fluke. A slim rectangle of foie gras terrine is layered with pastrami and served with cucumber cubes, candied spices and pastry discs. 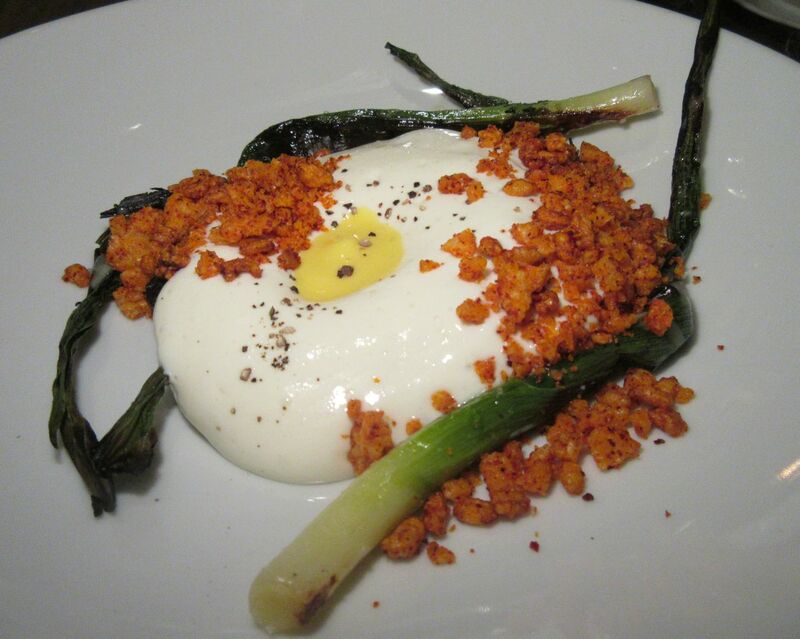 I especially like the baby leeks sprawled across Parmesan sabayon under smoked egg yolk with puffed barley crumble. Roasted carrots with farro and kumquats is also a delicious discovery. 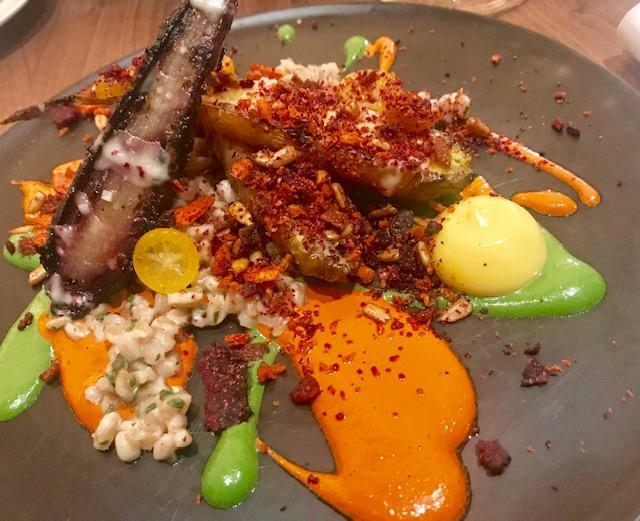 Wilted baby leeks sprawl across Parmesan sabayon under smoked egg yolk with puffed barley crumbs. 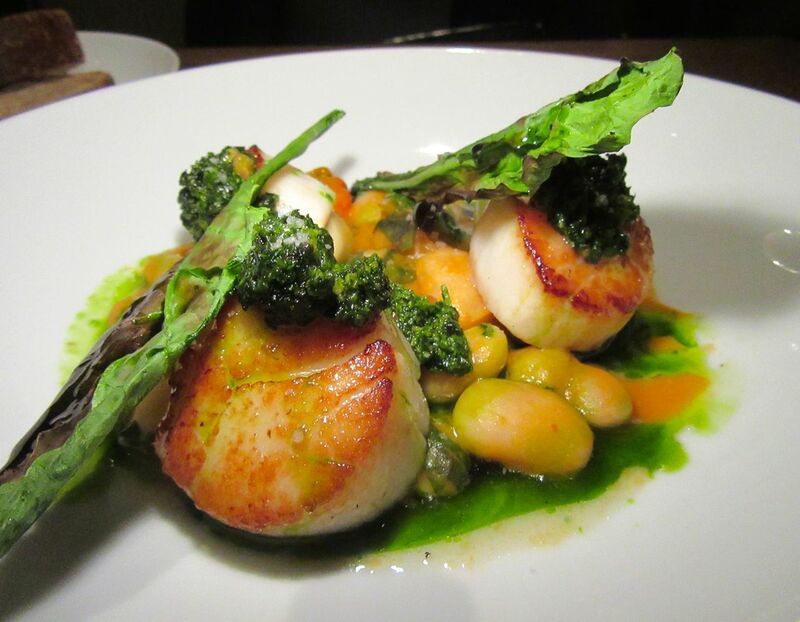 I notice that when scallops are on the menu, one of my companions will always order them. Every night of the year, one of my companions invariably orders scallops. All of us are pleased, dividing tonight's fat beauties, barely gelled and served with spicy pork sausage, and served with beans, sweet garlic cloves, and mounds of pesto. Much ado with cauliflower -- curry, seeds, nuts and dates -- is a disappointment. 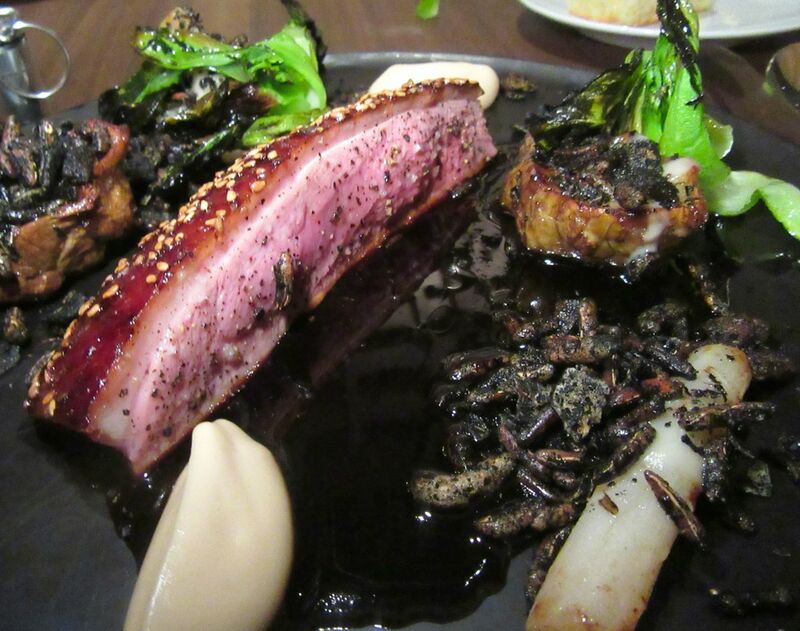 A friend showed me a foto of his duck at Intersect. It lacked the sooty look of ours. Guess they cleaned it up. Sesame-studded duck breast ordered “rarish” is tough but flavorful, although the sooty-looking vegetable and mushroom alongside are scary. Pappardelle with lamb ragu and preserved lemon, salty from kalamata olives and kicky from espelette pepper, is a must-have. I think about going back one more time for an encore before the menu evolves. 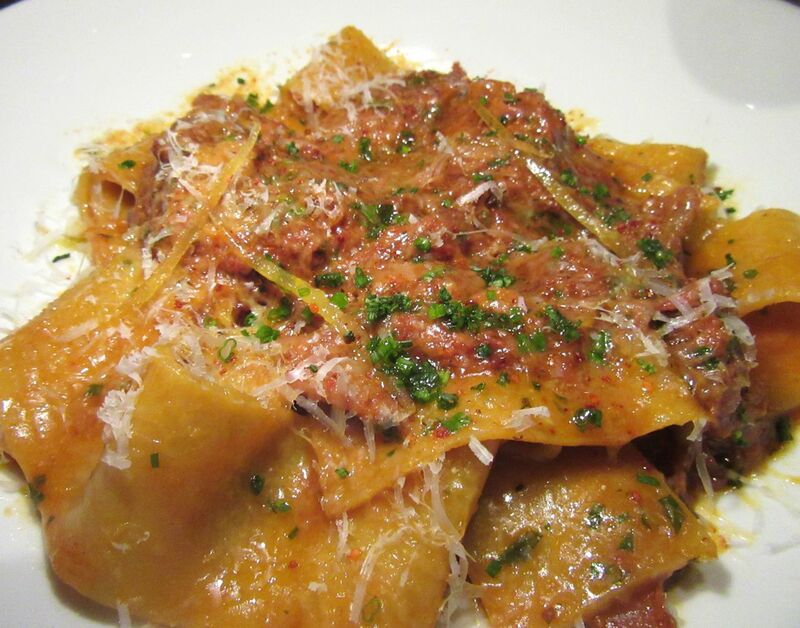 I’d be back soon for the pappardelle with lamb ragu and preserved lemon. But I’ll ask for it not so salty. The waiter brings the whole pork roast to show us where the toughish sliced meat came from. Maybe I’d sit at the bar for the crunch of fried chicken. Since the house made a big deal of sending us the crusty bird as a gift, I’m surprised to see it on the bill, but we’d paid the tab before I noticed. Well, it is just $16 compared to $42 for the pork with chickpeas and harissa, which is dry and tough to cut. Ellen chooses the evening’s special entrée, truffled fettuccine, also $42 – she encourages the waiter to keep adding flutters of black. I can’t bear abandoning what’s left, so I take it home for Sunday dinner. Since I eat out six evenings a week, I luxuriate in Sunday dinner at home. Often leftovers. 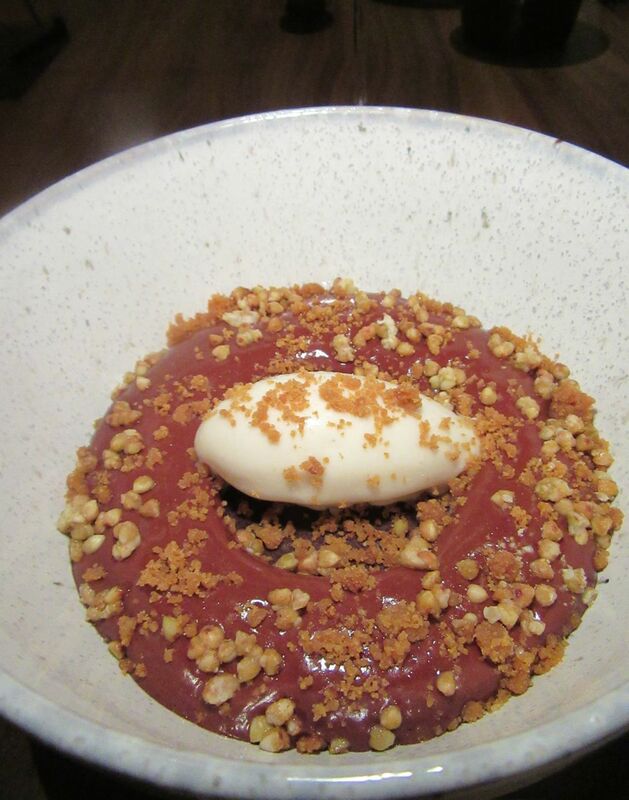 Pastry chef Fujimura’s rice pudding is an elegant creation with pineapple and jasmine ice cream. 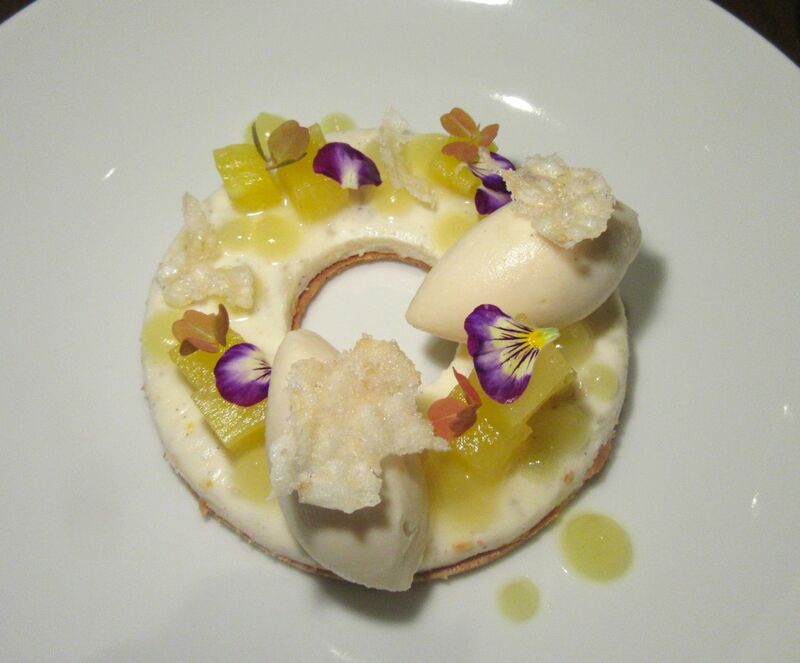 Pastry chef Kazuo Fujimura designs an elegant rice pudding with pineapple and an oval of jasmine ice cream. I would have chosen the Mont Blanc with chestnut cream and yogurt-yuzu sorbet but my friends want the warm chocolate mousse with hazelnut smoked bacon ice cream. Sadly, the mousse lacks rich chocolate pow. My friends are delighted with the smoked bacon ice cream. I find the flavor of the chocolate mousse unpleasant. The bill for the four of us is $316. “Intersect by Lexus is a non-tipping restaurant,” the receipt reminds us. “Your visits help us build fulfilling professional careers.” I’ll be back fulfilling more careers when the kitchen shifts to the next chef’s menu. Meanwhile, find me at the bar for fried chicken, the lobster roll and a maple bacon scone, developing my own career. 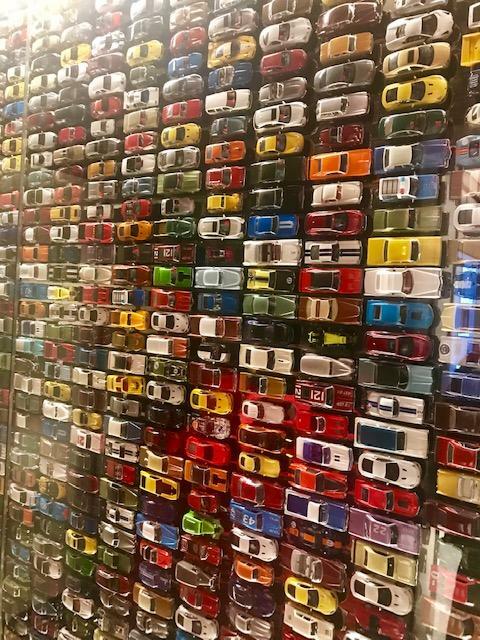 On the way to the ladies room on the first floor, I discover a wall of matchbox automobiles. 412 West 14th Street between Ninth Avenue and Washington Street. 212 230 5832. Monday to Sunday lunch 11:30 am to 2:30 pm. Sunday to Wednesday dinner 5 pm to 10 pm. Thursday through Saturday 5 pm to 11 pm. Café 8 am to 7 pm.